Ask anyone and they will tell you there is a difference between being a manager and a leader but where the difference lies doesn’t seem to get beyond the quote “managers drive, leaders lead.” History is filled with wisdom and case studies on the qualities of good leaders and effective leadership. Over the past few years there have been so many books, articles and blog posts published around the “how to’s” of becoming a good leader, but as tempting as it may seem to call yourself one, it is not that easy. It is said that management is career whereas leadership is a choice – a calling. Leaders get their power and authority not from their positions but from the trust people put in them. While at times you can tell a manager from miles away by a fair judgment of the dress code, way of speaking and mannerism, being a leader calls for another set of characteristics. To me, it’s about having that intangible charismatic component that some people have and some just don’t. Very early on on the DELTA course, trainees are required to plan and teach a lesson which their tutor and other fellow trainees observe and evaluate. Reflection on this lesson which takes account of the experience itself, the trainee’s own perceptions and the oral and written feedback received by the tutor and fellow trainees form the basis of a plan of action for the rest of Module 2 on the course. At different points, it is this plan of action that the trainee has to look back on and track their own development during their course, take stock and work on areas which are felt to be in need of improvement. Read Angelos’ blog post of how he sees this experience, its challenges and its benefits and think about your own diagnostic lessons. It should be said that this seems to be a great way to go whether one is doing a Cambridge DELTA course or not and helps teachers to become reflective and to think of solutions which will keep improving their planning and their teaching. Planning a Delta diagnostic lesson is first and foremost a decision-making process. The answers to questions such as what to teach or how to teach it should be decided well in advance of the planning process. In this post, I will share the steps I followed while preparing for it. 1. For the candidates to review, hone, and assess their practice in general. 2. For the candidates to review, hone, and assess their practice in relation to Delta-specific criteria. 3. For the candidates to gain experience teaching a group of students, most of whom they will teach again for at least one of their LSAs. Should you be afraid of the rumours about following a DELTA course? There are those who enjoy frightening prospective candidates away from following this course. And yet, all those who have completed it report the benefits to their teaching, planning, as well as the career options open to them. It is true that the course is demanding – but the skills acquired make it truly worth working for. It has been a while since my latest blog post and… guess why? Well, the reason is no other than preparing for the 8-week Cambridge Delta intensive course at CELT Athens. 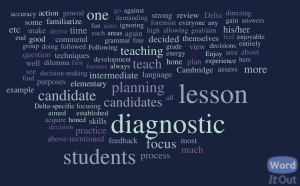 In the days/months to follow, I will be blogging about my experience as a Cambridge Delta candidate at CELT Athens. For now, though, I would just like to share with future -and present- candidates my only piece of advice: Do NOT read everything that exists online regarding the course! This year we started using a new communication platform for our online/blended DELTA courses, Wiggio. We already have our DELTA wiki, a wiki rich in resources, links, material, sample assignments and more, but felt we needed a kind of Social Network/Learning Management System that would allow us to communicate instantly and be rich in content features needed for our DELTA courses. We are very happy to have selected Wiggio. Below, I am reposting an interview which was just published on the Wiggio Blog a couple of days prior to this post. Read my comments there and try it out with your students yourself. This month, we connected with Wiggio user Marisa Constantinides. She is using Wiggio to manage students in her online Teacher Education Courses for English Language Teachers.